Each year, Americans spend roughly $30 billion dollars on pesticides, fertilizers, machinery, water, and energy in the name of maintaining thousands of little green blades of Kentucky Blue. Lawns are built into the American lifestyle; many of us have fond memories of pushing our toy lawnmower alongside a parent as they cut the grass every Sunday to keep it from becoming overgrown, or running through the sprinkler in the intense heat of late summer as it waters the crunchy, browning blades. And many of us have carried these traditions into adulthood, although they may have become more chore than play by now. Sure, our front lawns are a good place for a game of catch and convenient for letting the dog out, but think of all the time and money that goes into maintaining those little blades of grass. Despite the high cost and upkeep, grass has been tacitly accepted as the standard front yard without much question. There are a few activists and artists, however, who have been challenging the nature of our lawns and urging us to consider a more practical, affordable, and tasty option. But what if you grew food instead of a front lawn? This is the question that Los Angeles-based artist, Fritz Haeg, begs us to ask through his Edible Estates project, which entails installing lush and bountiful vegetable gardens in what are considered unlikely or unconventional places such as a city rooftop or suburban front yard. 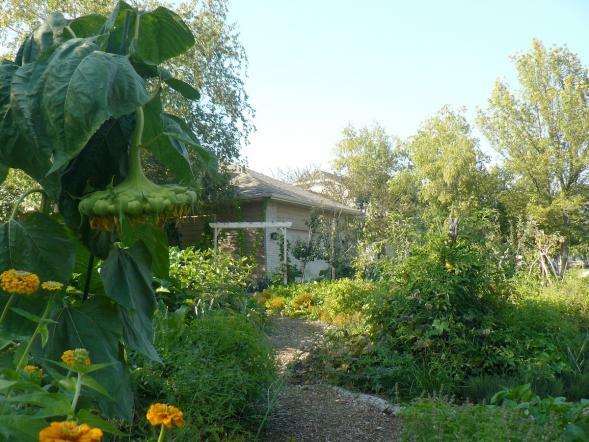 Since 2005, Haeg has installed 15 Edible Estates all over the world, the most recent being right here in the artist’s home state of Minnesota. 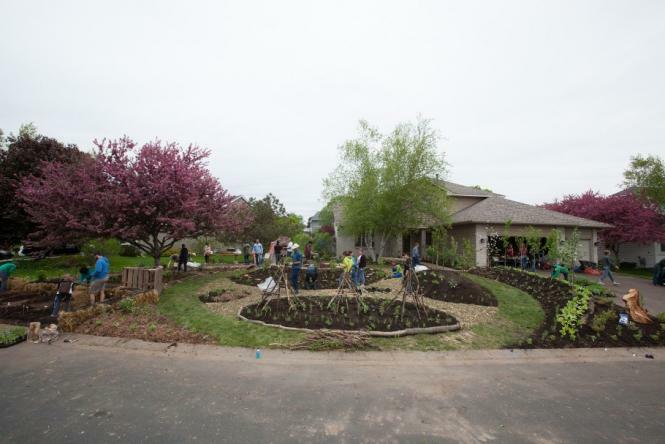 This past May, Haeg and a team of interested volunteers and Walker Art Center employees (the project was commissioned by the art center) broke ground in an ordinary front yard in the unassuming metro suburb of Woodbury. The yard’s non-native Kentucky Bluegrass was replaced with over 100 different herbs, flowers, fruits, and vegetables, transforming the yard into a wild, beautiful, and productive garden. Haeg even included an outdoor pizza oven and gathering circle for the family to fully immerse and enjoy themselves in their newly acquired natural setting. The result is visually arresting. After driving through the Woodbury neighborhood, passing identical, manicured lawn after identical, manicured lawn, I couldn’t help but inhale at the site of 6-foot sunflowers, colorful, bushy chard and buzzing bees. It instantly had me daydreaming about plucking juicy tomatoes off the vine and popping them into my mouth, or crunching into a cool, crisp cucumber. I started picturing myself lazing in the tall grasses and wildflowers on a warm afternoon. Essentially, it made me want to run home and start tearing up my own front yard right away. Haeg’s intent behind his Edible Estates project is to inspire the type of reaction I had to his Woodbury garden. He begs us to reconsider the front lawn as we know it. To recognize the traditional, two-dimensional, manicured lawn as a symbol of humans’ increasing disconnect with nature and how miraculous it can be when wild and diverse. 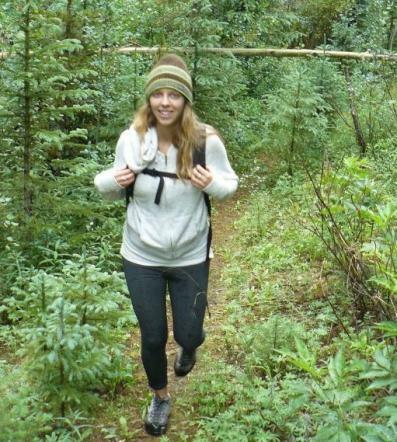 Haeg’s garden installations give us the chance to experience the alternative first hand. He states in his aptly named book Edible Estates: Attack on the Front Lawn that “Gardens, especially urban ones, make visible the intimate relationship between people, cities and food, constantly reminding us of the complexities and poetry of growing food and eating.” Not only do gardens reconnect us with nature, but growing food instead of grass is productive! It’s economical! After all, the USDA estimates that for every dollar spent on seeds and fertilizer, we can grow 25 dollars worth of garden produce. Just think of the impact a yard full of vegetables can have on your monthly grocery bill. Believe it or not, the concept of replacing lawns with gardens isn’t radically new. Michael Pollan weighed in on the topic in 1989 with his article, “Why Mow? The Case Against Lawns.” He commented, “Gardening, as compared to lawn care, tutors us in nature’s ways, fostering an ethic of give and take with respect to the land. Gardens instruct us in the particularities of place. They lessen our dependence on distant sources of energy, technology, food and, for that matter, interest.” We’ve seen a more public showing of this sentiment in the past few years with artists like Haeg making prominent visual statements as well as the emergence of “guerrilla gardeners,” activists who plant unauthorized gardens in abandoned lots, private land, or roof tops. Haeg’s Woodbury garden installation is part of a 6-month residency at the Walker Art Center which includes a foraging garden in the Walker Sculpture Garden along with ongoing workshops focusing on domestic skills such as canning and the exhibit Domestic Integrities, which runs Thursdays-Sundays until November 24th. Part of an on-going series that examines how gardens are incorporated into the home, the exhibit also looks at the larger idea of re-cultivating domesticity. 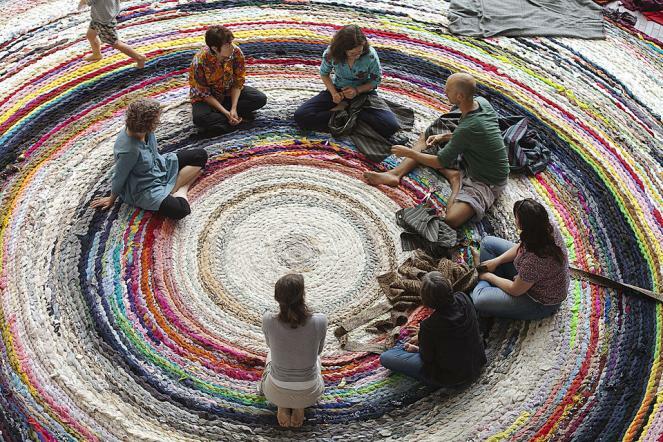 For example, the exhibit features a large rug crocheted from discarded local materials gathered by local residents that help to create the rug themselves. The rug acts as an altar displaying weekly, rotating items born of local residents’ domestic skill and labor such as home baked bread, handmade paper, or vegetables from a backyard garden. The exhibit is incredibly welcoming; I spent my time with a hot cup of tea, comfortably seated on the huge center rug chatting about gardening with other visitors. Haeg has really created a community space that inspires and enlightens us to think in a new about how we live our lives. In Domestic Integrities, Haeg comments on how our word has become so specialized that most of us have lost touch with the knowledge of how to provide for our basic needs and how it’s the nature of these skills that connect us together as a human race, a theme that is present in all of Haeg’s work. Like Haeg’s Edible Estates projects suggest, the best place to start reconnecting might just be in our own front yard. 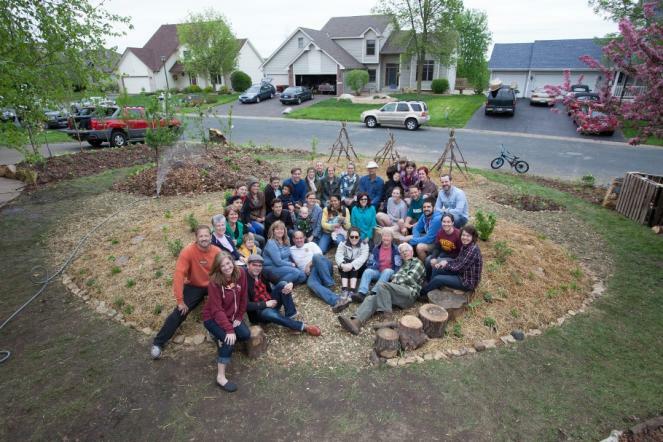 Note: Image at top, of Haeg and crew, and of Haeg and volunteers are courtesy of the Walker Art Center; image of the Woodbury Edible Estate is by the author.